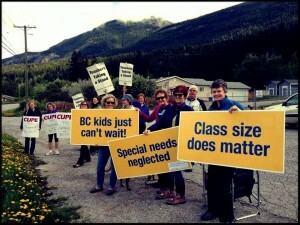 Tara Ehrcke, May 28, 2014, RankandFile.ca— Two days into rotating strikes and a “partial” lockout by the BC government, independent polling shows strong support for the teachers. An Angus Reid poll showed that among the general public, 41 percent supported the teachers while 30 percent support the government. Among parents with children in school, the support is stronger, with 51 percent supporting the teachers and only 28 percent support for the government. The issue has also drawn the attention of BC’s opposition parties – both the NDP and the Greens (who have one sitting MLA). But while neither party supports the current actions of the government, they are also unwilling to take a clear stance supporting the demands of the teachers – in particular, the restoration of class size and class composition limits and a fair salary increase. The NDP does not have a great track record on this issue. I’ve been following their position in every election since the limits were illegally stripped back in 2002. Not once since 2002 has the NDP come out in support of restoring the limits and reinstating teachers’ collective agreement language. I have personally asked this question in 2005, 2008 and 2013, and never has an NDP candidate I have spoken to committed to restoring the language or the funding. In the last election, in 2013, the NDP platform included $100 million for education. This is dismally short of the $300 million needed to restore class sizes and additional funding to address increased costs to school boards. But sadly, it is even less than the $178 million they were proposing in 2005. But never once in that twelve years has the NDP promised to do the right thing. The issue is not “confusion” as he claims, rather the issue is large, complex classes and too few resources. It sometimes feels that the NDP simply like to use our situation to play partisan politics rather than address the issues. The biggest media story they made of the last court case (when our contract stripping was found illegal for a second time) was the fact that the judge found the government to have provoked a strike. While important, the revelation about the government’s deliberate provocation of the strike pales in comparison to systematically underfunding schools and robbing teacher’s of their constitutional rights. I wonder if either Olsen or Weaver believe that if someone steals your house, and you get into a feud about it, the right answer is to just split it in half in a compromise? Party politics aside, teachers are strong on the ground and the mood solid.Teachers are angry about the lockout, in which we do all our work for 90% of our pay. But spirits are high – we’re giving it our 90%! 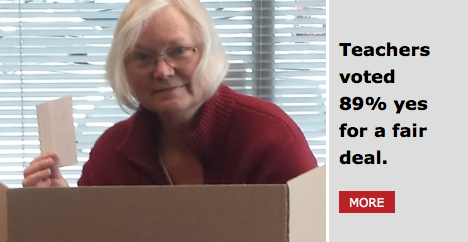 Tara Ehrcke is bargaining chair and past president of the Greater Victoria Teachers’ Association. Lakoff and Johnson’s Metaphors We Live By changed forever complacency about the structure of language by showing how deeply rooted metaphors are constitutive of the way we think and act rather than simply flowery poetic forms of language use. These metaphors are deeply embedded and can be simple (up is good) or multi-faceted (love is a journey; argument is war). Metaphors simplify what is complex or new and they are never neutral but communicate values and ideologies, often shifting or diverting attention in their use. 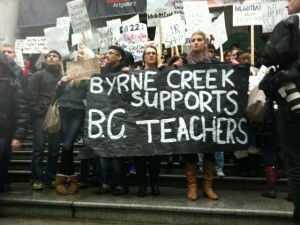 There is no doubt in British Columbian’s minds the BCTF and the BC government do not have a warm fuzzy relationship. Indeed the working relationship between the two has seriously deteriorated over the past 10+ years. The current labor conflict between the British Columbia Teacher Federation (BCTF) and the British Columbia government has politicians, pundits, students, and others saying labor and management is a marriage. The marriage metaphor now crops up to offer ‘a way forward’ in labor-management in BC public education. Let’s be clear about one thing to start. This metaphor is not meant to be a universal metaphor for labor-management… would anyone think the locked out IKEA workers and IKEA or the teamsters and the Port Authority are married to one another? Not likely. Here are a few illustrations of the marriage metaphor being used to (re)construct labor-management in BC public education. Note that the inclusion of students as off-spring of the BCTF-BCEd marriage is the core idea upon which the metaphor turns. The marriage metaphor, as it is used in these cases, draws on a few key ideas: there is a couple (BCTF and BCEd), they have children (all students in BC schools), and the parents have common goals and whatever differences they have in achieving those goals must be sorted out for the sake of the children (students) because divorce is out of the question (hmmm, what kind of marriage is this? ), and if needs be counseling (BC Labor Relations Board Relationship Enhancement Program) should be sought to overcome differences between parents. Does the Marriage Metaphor Work? Paranthetically, the marriage metaphor at least gives us a respite from the education as market with children/families as consumers metaphor that is even more ubiquitous in discussions of public education. The marriage metaphor may be more tenuous in assuming that both partners share the same goals, in this case doing right by the kids. Let’s assume that this is a common goal, but what each partner means by doing right by the kids may be fundamentally different. For example, one need not be too cynical to suggest BCEd’s doing right by the kids is to encourage individualism, focus on vocational, jobs oriented education, get those kids out on their own as soon as possible and contribute to the economy. And, although maybe a bit generous, BCTF’s doing right by the kids is in creating a more comfy, tenable, child-friendly workplace for themselves which will in turn make for happy children. These are not trivial, just humorous differences. The labor-management as marriage metaphor diverts attention from fundamental and healthy conflict over the purposes and interests served by public education. The current BC neo-liberal oriented government interests are not the same interests of the poor and working class, First Nations communities, rural and inner city communities, education workers, many parents. How ever we think about public education and the relationship between the BCTF and BCEd we will be thinking metaphorically. It’s important for us to use our metaphors wisely and mine them for understanding and taking action. Maybe the marriage metaphor has some traction in finding ‘a way forward’, although I doubt it. Perhaps we should be finding ‘our way home’ or ‘destroying the system’ or ‘moving on,’ but those are metaphors for another day. CBC News, May 12, 2014–Parents in B.C. are being prepared for an escalation in teacher job action should current contract negotiations fail. Vancouver School Board superintendent of schools, Steve Cardwell hasissued a letter to all parents and guardians warning of potential rotating school closures across the province should a settlement not be reached. “We understand that the BCTF may choose to escalate their job action to a second phase which could include ‘rotating’ school closures,” the letter states. The letter was not intended to alarm parents, says VSB spokesperson Kurt Heinrich. Rather it was intended to keep them in the loop. “A big part of that is just to make sure that parents aren’t going to be caught unaware of the situation,” he said. A B.C. Teachers’ Federation spokesperson said that while escalating job action is a possibility, there are no plans at the moment to move to stage 2 job action. During stage 1 action, teachers are refusing to supervise students outside the classroom or communicate in writing with principals and other administrators. Teachers are still taking attendance, marking and assessing students, completing report cards, communicating with parents and participating in volunteer extracurricular activities. Their contracts expired last June, and the federation says it’s being forced to take action because negotiations are slow. Katie Hyslop, The Tyee, May 4, 2014– It’s been almost a year since British Columbian teachers saw their contracts expire, but the union and its employer couldn’t be further apart at the bargaining table. In contrast, the B.C. Public School Employers’ Association is proposing a 10-year deal, with a 1.75 per cent wage increase on ratification. It includes a total 6.5 per cent wage increase over the first six years, with contract negotiations reopened in the sixth year to determine further, if any, wage increases. Class size and composition levels, as imposed by the government through 2012’s Education Improvement Act, would remain the same under the employer’s terms. Efforts to pressure each other into making concessions have had little effect. Now, over 40,000 members of the teachers’ union are currently in stage one of a three-stage “job action,” after 89 per cent of them voted in favour of a gradual strike last month. Their employer responded to the action last week by presenting the union with an estimated $5-million bill to cover teachers’ health and welfare benefits premiums in June, unless a negotiated deal is reached before the school year ends — a move the union called illegal. 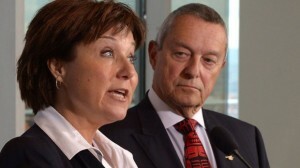 Current negotiations, ongoing for 15 months, are further complicated by a B.C. Supreme Court decision in January that found the government’s response to an earlier ruling, preventing teachers from bargaining class size and composition levels until after current contract negotiations are settled, was also unconstitutional. The government appealed the January decision, which is expected to be heard in court in October. 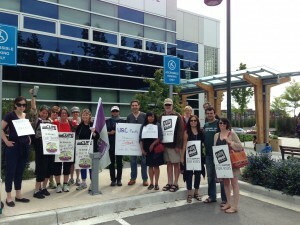 Collective bargaining between the B.C. government and the union has a dizzying, yet important history. The troubles began under the Social Credit government of the 1980s and continued under the New Democratic Party government of the 1990s, but the issue has become much more heated since the current BC Liberal government came to power in 2001. Teachers haven’t forgotten any of it. Looking back at 13 years of quarrelling, one may find hints to where the current bargaining dispute is headed. If you don’t remember every strike vote or court case, this refresher is for you. ATA News release, May 5, 2014–Alberta Teachers’ Association President Mark Ramsankar is calling today’s report of the Task Force for Teaching Excellence an assault on teachers and is raising serious concerns about direct ministerial interference in the work of the task force. attempt to extort compliance from the Association by threatening to remove principals from membership and/or break it up. Ramsankar says the Association has received information from many very well-placed sources that indicate that Minister Johnson and his bureaucrats have been very active in directing the work of the task force, including the drafting of recommendations. Ramsankar is calling on Premier Hancock to immediately and clearly outline the position of the government on the task force recommendations attacking the profession. The Alberta Teachers’ Association, as the professional organization of teachers, promotes and advances public education, safeguards standards of professional practice and serves as the advocate for its 35,000 members. BCTF, February 25, 2014– After a full year of bargaining and more than 40 sessions at the table, BC teachers have called for a strike vote to push back against major concession demands, an unfair salary offer, and a deliberately confrontational attempt to reverse the recent BC Supreme Court decision on class size, composition, and staffing levels, said BCTF President Jim Iker. Iker said he was incredibly disappointed and frustrated as teachers have worked hard this round to create a sense of calm and purpose at the bargaining table. While the last round was dominated by government acting in bad faith, this time teachers were hopeful that new players and a new framework agreement would help both parties reach a fair and reasonable deal. New language that would yet again strip all provisions on class size, class composition, and staffing levels for teacher-librarians, counsellors, special education, and other specialist teachers. A salary offer that starts with a 0.5% increase on the date of ratification. The increase is not retroactive. Because the previous contract expired last June, this means zero for all of 2013–14 school year to date. The proposal is followed by another zero for 2014–15 school year and then various ones and point fives over the next four years. 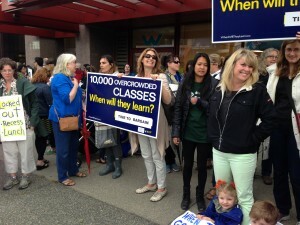 The last four years of the 10-year term, an idea teachers rejected in June by a province-wide vote of 96%, features an ill-defined indexing scheme that even BCPSEA’s negotiators could not explain. On the salary front, BCPSEA’s offer means BC teachers are being asked to take up to two more years of zeros after no salary increases in 2011–12 and 2012–13. “Despite most other public sector workers receiving increases in the range of 3.5 to 4% over two years as part of the co-operative gains mandate, the government has directed BCPSEA to pursue a totally different agenda with teachers,” said Iker. “Trying to force wage freezes on teachers for another two years is not reasonable or fair, given what the government negotiated with other workers in the public sector. Teachers are asking for an increase that addresses the rising cost of living and a market adjustment that reflects how far we are behind other teachers in Canada. We believe that’s fair and reasonable. 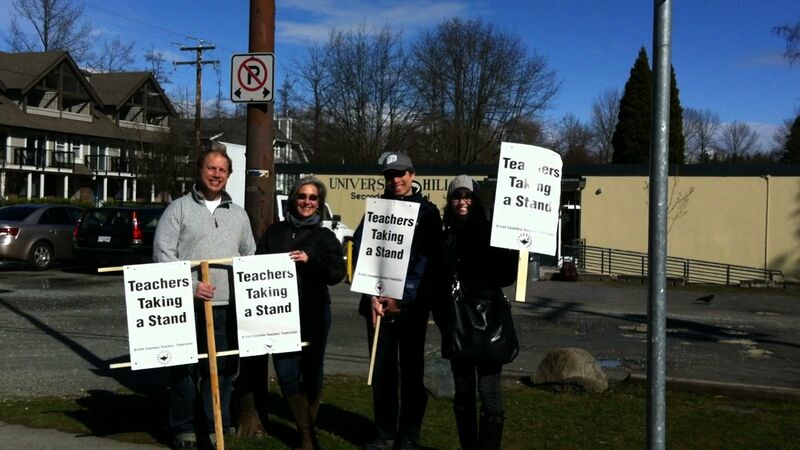 British Columbia Teachers’ Federation, January 27, 2014: An historic day for public education and labour rights in BC. The BC Supreme Court reaffirmed that provincial legislation limiting teachers’ bargaining rights is unconstitutional, restored collective agreement provisions stripped in 2002, and ordered the province to pay $2 million in damages plus court costs. 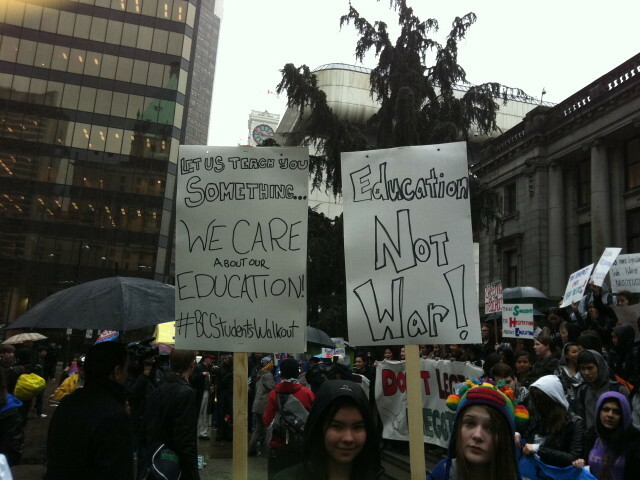 Over a three day stretch, secondary students organized, marched, walked, spoke, and shouted out against oppressive labour legislation in British Columbia and for their teachers and the BCTF. It’s rare that secondary students get opportunities to unify as a political force at the provincial level, but now in this labour dispute the students are making a difference. On Friday, 2 March, thousands of students walked out of their classes and schools and rallied across the province. In Vancouver, the students descended en masse for a rally at the gallery. On Tuesday, 6 March, at the BC Fed and BCTF rally hundreds of the youth marched with the unions down Government Street and to the steps of the BC Legislature. For the crowd of 6,000, two young women, Hannah Case and Erin Galbraith, spoke a lotta truth to a power undermining their teachers’ rights. In Vancouver, on 7 March for the rally at the gallery, secondary students Navi Rai and Melissa Wong stood together on the steps and voiced their support for the teachers’ rights and their right to a fair government. Both were active in organizing Friday’s walkout. And raising the roof of nature, Chandler McCorkingdale rapped. 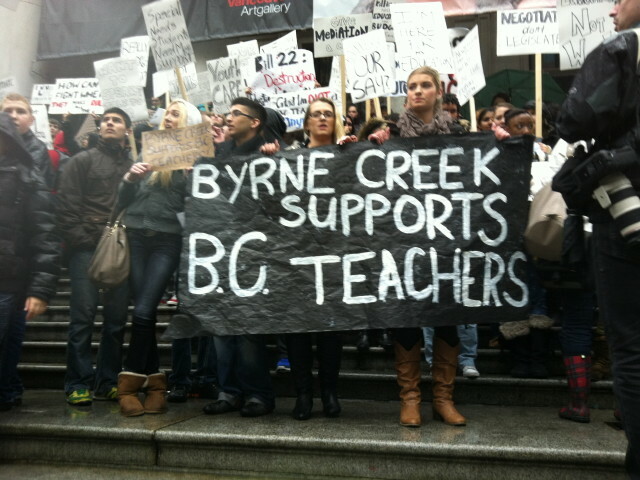 Sorry, BC Liberals, the students and the public are standing with the teachers. Now, where in the world are the missing BC post-secondary students, especially the Education majors? Especially now? I know that some are organizing online. And I know that the Canadian Federation of Students BC is 100% behind the BCTF and the teachers. But across three rallies not a single post-secondary student signed onto the speaker’s lists. Not a single one spoke while thousands of the secondary students have shown their strength as a political force. 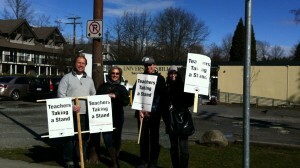 Perhaps UBC’s Teacher Education Officer John Yamamoto’s interview with the CBC’s Morning Edition on 7 March is telling. Yamamoto advised that the Education students should, nay must, remain neutral. Some advice for the teacher candidates– one gets the sense that he thinks he is advising 700 administration candidates! Where are the post-secondary students and will the CFS BC organize the group to be heard or present? The BC Fed is Rallying at the Legislature, moving on a massive petition, and planning rallies around the province. Support the Teachers / Stand up for BC !!! Once again on the leading edge of the labour movement, BC teachers are on strike across 60 school districts within the province. In a show of solidarity, community and labour advocates have vowed to support the teachers and the BCTF throughout the job action. On day 1, teachers and supporters showed up in force at 7:00 to create an informational line, keep signs up, and talk to those who dropped by or others workers continuing their work in the schools. The 7:00-10:0o shifts in Vancouver were met with inclement conditions– horizontal rain and howling wind. The weather spirits smiled on later shifts and heartfelt, with the public on their side, the teachers could smile for a few moments as well. Within labour, an informational line is not a picket line per se. Labour disruption proves to be an effective strategy and in this case the teachers are taking advantage of an opportunity to show their strength, generate public support, and strike before the BC Legislature passes the ominous anti-union Bill 22. 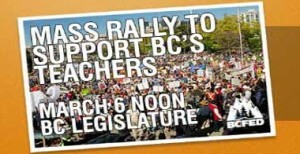 The BC Federation of Labour is rallying support and uniting the movement tomorrow (6 March) in Victoria.